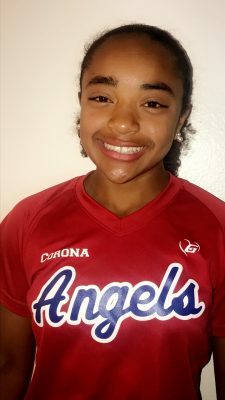 Jasmine Polk of the Corona Angels has speed and home run power. You can count on one hand the players from the 2023 class—current 7th graders—who have verballed, but we have our first publicly known one to a Pac-12 school now as outstanding athlete Jasmine Polk announced this week she will be a Cal Bear. Jasmine is a multi-talented athlete who can do most everything on the field and after a standout performance last fall at the OnDeck West Coast Elite Camp she was labeled the “real deal” by the event organizers and recorded an 82.95 on the Allister Index (the average for a Top 25 college player is 87.5). 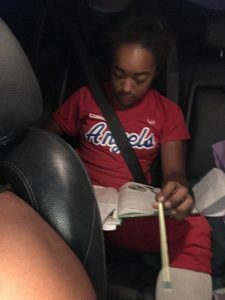 At the D9 showcase in Florida in October, Jasmine showed how she can take over a tournament as she hit an over-the-fence line drive home run, had six RBIs, scored three runs and had zero errors playing shortstop, second base and third-base. 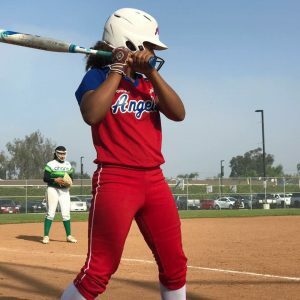 After a standout fall that saw her hit more home runs than commit errors, her teammates nicknamed her “Puig” after Los Angeles Dodgers five-tool outfielder Yasiel Puig. Here’s a closer look at this Corona Angel standout you’ll be hearing a lot about for years to come! Top Honors/Accomplishments: Principal’s List and Honor Roll, 1st Place in Garden Grove Poetry Contest, invited to OnDeck West Coast Elite Camp last November. Other Universities Considered: Visited Oregon and Missouri, attended camps at Ole Miss and Arizona. Congrats on your verbal, when did you actually commit and how did you do it? Were you in person, in Berkeley, over the phone or another way? I committed on Tuesday February 6, 2018. It was over the phone. It’s a big decision so I wanted to talk to my family and Coach Marty (Tyson) before accepting. Jasmine had a strong fall that cemented her status as one of the top players in the 2023 class. You’re the first verbal from your class to commit to the powerful Pac-12… how does that make you feel? It actually makes me feel that I now have to start to work 10 times harder than ever before because now my expectations have increased and I have to raise my standards to become the best player I can be. When did you decide it was going to be the Bears? Did you have an “A-ha” moment when it hit you that Cal was the school for you? I decided on Cal Berkeley when I went over the pros and cons of the school. Honestly, the only con was the traffic, but other than that, the fact that it is the No. 1 Public University in the U.S and No. 4 in the World really just hit the nail on the head. I loved the competitive atmosphere and you can really tell that the coaching staff really cares a lot about the players. The moment I stepped on the campus it just really made me feel at home. When and how did they first see you and what did they say they liked about you enough to offer? I personally don't know when they first saw me, but they told me that I had a lot of talent and heart for the game. Obviously you have several years til you hit campus, what prompted you to commit now as to opposed to waiting a while longer? It was what I wanted and my parents and my coach supported me. I just couldn't see why I had to wait. Jasmine Polk is also a standout student and took 1st place in a poetry contest. I have to work hard and work on being better every day. For the other players and coaches to see if I'm really that good means I have to just be me and show them why Cal Berkeley chose me! What was the first thing you did to celebrate your committing? The first thing I did was to go to the gym. What do you like to do when not between the lines on the softball field? I bake, cook, go to the gym, watch Netflix, play Fortnite, read, and, of course, study! Do you have any superstitions when it comes to softball or even off the field? I don't really have any superstitions when it comes to softball or anything else. I believe in God’s plan. Where do you see yourself 5-10 years after you stop playing the game? After softball I see myself in the FBI and putting bad guys in jail! I also see myself helping grow the sport. What do you love about softball so much to make it a sport you’ll play into college and maybe beyond? I love that in softball you are always thinking of the next move like chess and that you’re always doing something and not just sitting around. Ball, Bag, Backup.